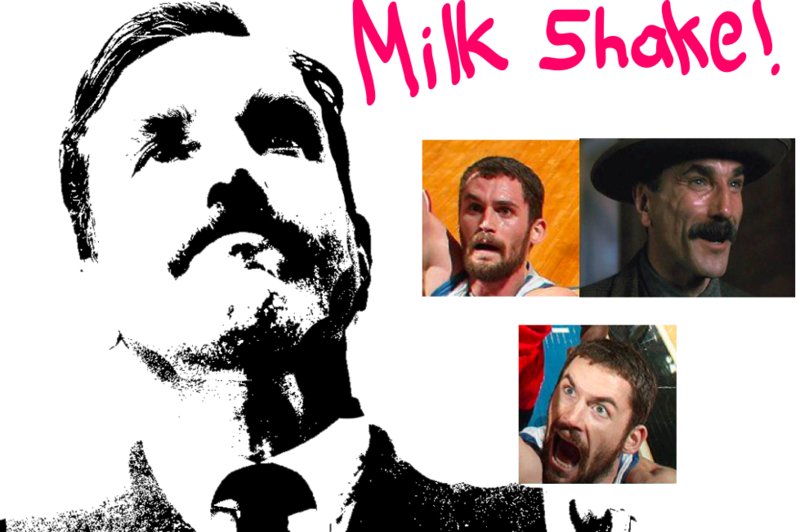 Kevin Love: The Wolves’ Daniel Plainview? Patrick J: The Wolves were defeated by the Raptors last night 104-97. The Raps are a surprisingly good 3-1 on the preseason. *Kevin Love: Kevin Love played like Kevin Love. He looks more and more like Daniel Plainview by the year. Which is actually pretty cool, because that’s the kind of ruthless competitiveness the Wolves need in order to become an elite team in the Western Conference. Love played well in the minutes he got last night, shooting 9-19 (Eds. Note: Many of those missed shots were misses of his own putbacks, for which he got credit for offensive rebounds, which eventually led to makes.) K-Love is in great shape, and, barring injury, he should be a shoo-in on the All-Star team this season. Andy G: That Ricky 0-fer was ugly. A lot of those looks were of the wide open variety. 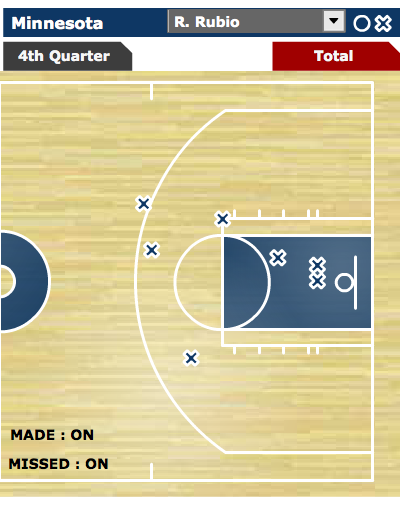 (See shot chart below.) As much as we all love Ricky and what he brings as a passer, defender and leader, he needs to make shots when defenses dare him like that. We’ve seen this scenario in Minnesota during the Sebastian Telfair Administration(s). In Boston, it continues with Rajon Rondo. When the point guard can’t make open shots, the team offense suffers. Rick Adelman not happy w/another flat effort from Wolves at home. "We're not the Spurs." Can't just flip a switch. In any event, Coach gave more burn to Ronny Turiaf, who seems penciled in as backup center, and Othyus Jeffers, who is gunning for a roster spot. The second unit got beat up last night by Toronto. I hope they don’t miss Budinger as much as it sometimes seems they might. There's definitely a hint of Dolomite about Othyus Jeffers. Any objections to me referring to Othyus Jeffers as YOLOMITE? NSFW, depending on where you W.